Abstraction and slicing are both techniques for reducing the size of the state space to be inspected during verification. 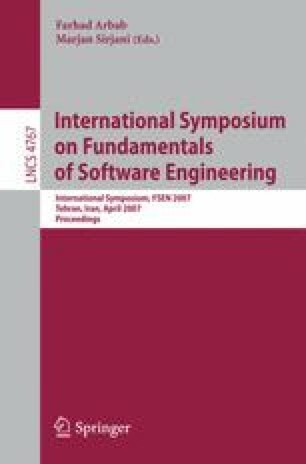 In this paper, we present a new model checking procedure for infinite-state concurrent systems that interleaves automatic abstraction refinement, which splits states according to new predicates obtained by Craig interpolation, with slicing, which removes irrelevant states and transitions from the abstraction. The effects of abstraction and slicing complement each other. As the refinement progresses, the increasing accuracy of the abstract model allows for a more precise slice; the resulting smaller representation gives room for additional predicates in the abstraction. The procedure terminates when an error path in the abstraction can be concretized, which proves that the system is erroneous, or when the slice becomes empty, which proves that the system is correct. This work was partly supported by the German Research Council (DFG) as part of the Transregional Collaborative Research Center “Automatic Verification and Analysis of Complex Systems” (SFB/TR 14 AVACS, www.avacs.org).